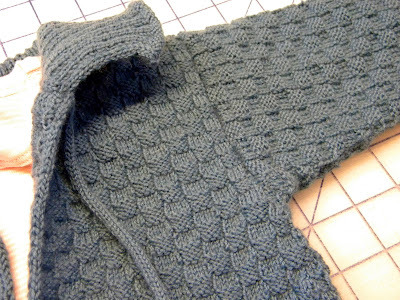 I have been knitting a new little baby cardi and while I have been doing it, I have truly tried to fine tune all the little bits like doing increases, decreases so that they would fit inside the pattern. 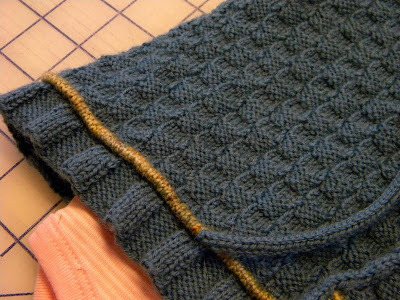 I did not expect this but while attaching the first sleeve to the cardi I realized how uneasy I felt when attaching the sleeve. I just felt that the cardi was leading me by the hand and that I was not in control of the process and although I have learnt the hard way that my way is not the best way (not always, well... hardly ever really!) in other areas of life, I want to control my process in hand work. So I needed really to slow down to see what was the matter, what was it that I did not like. And as always, well, almost always, it is the lazy part in me, that wants to make shortcuts, to see the stuff finally finished and so wanting really to speed through the final bits. Having realized that, the rest really was not that difficult. I already knew how the process was supposed to look and feel. Finally I have a stretchy sleeve opening with a seam that should last. I did it the way my Mom has taught me to do, except that she has told me to split the yarn, or look for similar colour but lighter weight than in the actual knitted garment. This is what I did, but if (and I am hoping that I will) I write the pattern, I will explain it in detail there, but I had live stitches in the sleeve and I picked up stitches from the sleeve opening of the cardi onto a small needle the way one would make a matress stitch and then I did a three needle bind off. I think I like the result. I love roses. For years I was sad that only a few grow up here. I have two kinds of rose bushes, one that we call Midsummer rose (Rosa pimpinellifolia) and other that we call Kurtturuusu (Rosa Rugosa) which are both very beautiful and sturdy, as they survive the harsh winters. 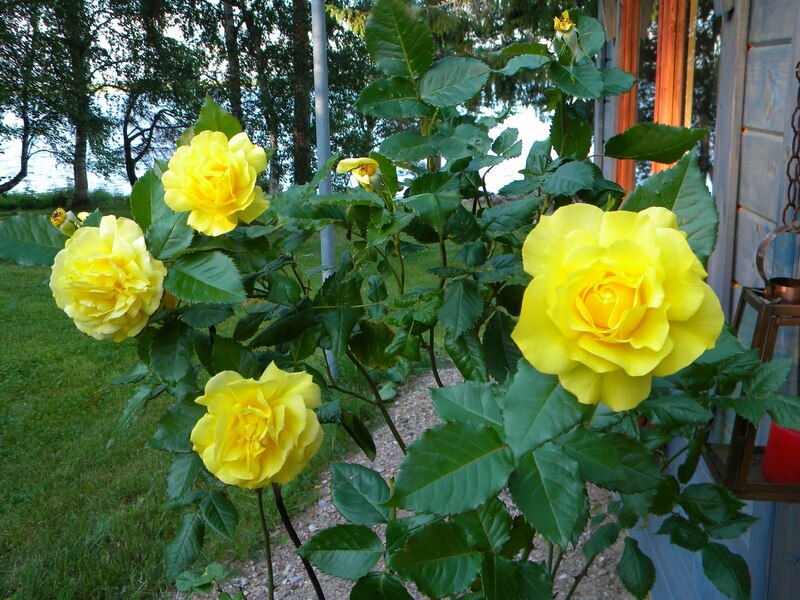 Some years ago I bought my first two yellow (pot)roses and those two bloomed beautifully during the whole summer. When autumn came they kept going until the very late September and even the first frost did not scare them. They were in such a good condition in the fall that I just carried them into a room that is behind our garage. The temperature there is kept just above freezing and the room gets lots of light when there is light (remember that we have almost none in midwinter) early in the spring. I took them there and almost forgot them. When I remembered I watered them and they looked quite bad during the midwinter so it truly was a surprise when I happened to go into that room early in the spring and noticed that they had started to make new leaves. I am not a gardener and have no skills - none! - in that field, but I was lucky and the roses survived their first winter. Ever since I have done the same with my roses and they just seem to be able to pull through the winter there. In the spring, early summer, they get new soil and some nutrition in hopes of summer blooms. I have always loved roses and their scent but once was told that roses are for elderly ladies - I am not sure why and if this is true at all, anyway that saying stuck. I am not sure just how old one should be but now that I am over fifty, I think I am old enough. I have been searching for the right kind of rose perfume (or edt) for some time and I think I just found it in London. It is Jo Malone's Red Roses; the scent is soft, it is not too strong and it is not hard in any way. (Serge Lutens Sa Majesté La Rose is good too.) And talking of age and what is suitable for this age... I think I have just about enough years (and wool!) to start using lavender too, but so far have not found the right perfume. I am looking for pure, tender, light, airy, clean and easy scent and if you have any recommendations for me, please let me know. This is all today. It is sunny and warm Monday, a good start for a week! PS. There are some clips of Portuguese Knitting in Youtube... I have not yet looked at any closely, so cannot give recommendations at the moment. Lovely cardi, so beautiful details! I luv the scented Roses and Lavender and have a nice collection of French soaps. Love the cardi-the details are amazing. And your roses are beautiful...with or without a green thumb, you must be treating them just right. Your roses are beautiful. We have just built our first rose bed and i love it - must be getting old........but i don't care!! Love the cardi--and I hope you do write up the pattern. I love learning new knitting techniques. About roses being for for elderly ladies--I cannot imagine it. 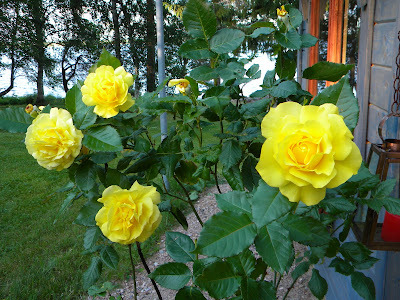 I've loved roses--especially yellow roses, since I was a small child gardening with my grandmother. It's like knitting being for elderly ladies. Like you, not sure how old 'elderly' is, (I'm a bit over 50 myself), but I'm glad I have roses (and knitting) in my world. 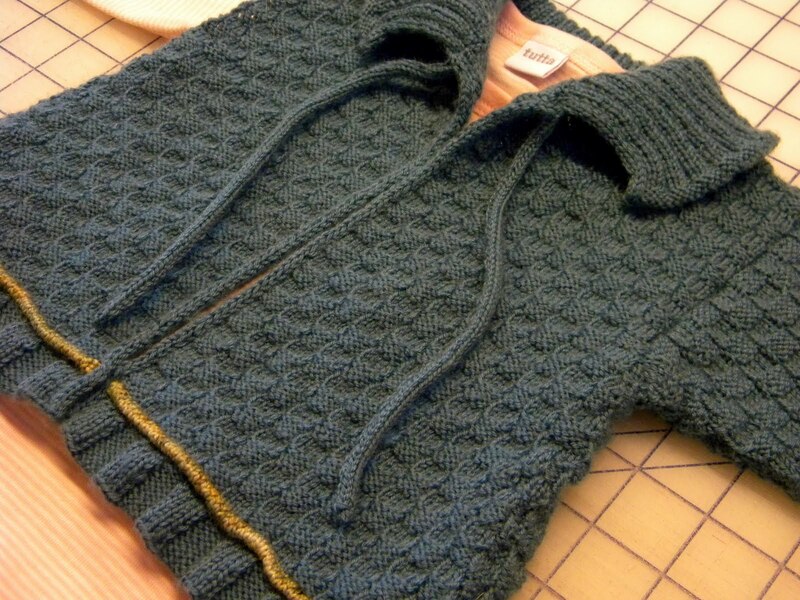 The little jumper is lovely and I truly hope you will post a pattern. Lene, the baby cardi is precious and I love the details. I very much like the look of the sleeve seam; I will have to try it on the baby cardi I need to knit soon. Thank you for sharing! I took a History of Fashion class in college and the teacher told me that flower scents - especially the flowers that grow regularly in environments similar to France - made the best inexpensive perfumes before perfumeries went largely chemical. So elderly ladies with little money probably wore rose/violet/lavender perfumes. That explanation made a lot of sense to me, but I don't know if it's completely accurate. ::smile:: Regardless, enjoy your roses! They are lovely. Now that I am 55, I wear lilac from Crabtree & Evelyn. They have some lovely rose and lavender scents as well. I also like India Hicks' Spider Lily. Just sweet and light. The little cardi is quite lovely. I love the finishing touches. What a precious baby cardi. The roses are spectacular. Happy summer! Well, I like the Healing Garden's Lavendertherapy. I haven't used it in a while, since I found something else that suits my current mood better, but I liked it a lot. Beautiful cardi Love the pattern and colours. Althogh rose is often set down as a smell for a Lady of a Certain Age ... I do not agree. I'm a little shy of thirty, and a nice, fresh rose smell is what I always think of as my 'Lady' smell - very elegant. I also use lavender- but, as I am not much given to edt, i use scented handcream (Jurlique), and store my woollens and small things with lavender sachets - so it's just a little hint. I enjoyed this post so much. I love, love, love the baby cardi. 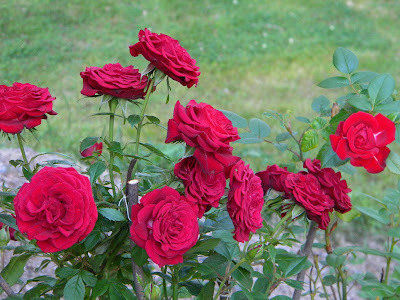 And the idea of such beautiful roses at the Arctic Circle is heart warming. I always loved roses, also when I was still very young...As about lavender, I like the "L'Occitane" Lavender shower gel very much. They do have a lavender fragrance, too, but I haven' t tried it yet. Maybe this would be something for you? I liked roses since young. 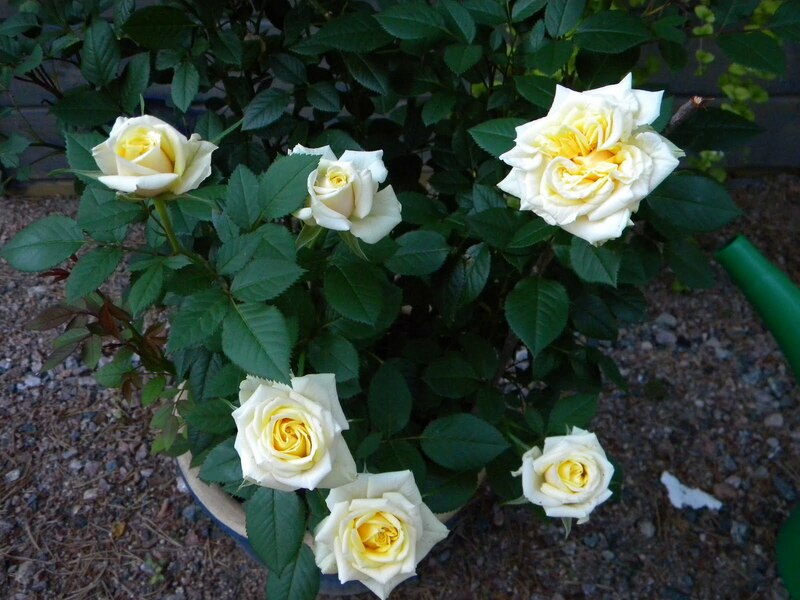 You have taken really good care of your roses and it can be seen through the photos. Also your cardi looks amazing! Such exquisite details from a talented lady. Funny how people say that - my friend was horrified to be given Nina Ricci's L'Air du Temps because she thought it was an "old lady" scent yet I have loved its lily-of-the-valley scent since I was a (very) young mother! I also love rose and lavender (and have heard the same things) but am growing into them, now! Scents you may enjoy that are among my favourites if you like those fragrances are Lanvin's 'Eclat d'Arpège' (a classic), Estée Lauder's Pure White Linen (the blue one) or Blumarine II, which I had to search for. These scents also have the powdery feel that I like. Last but not least, your knitting work is art to me and your latest baby garment no less! 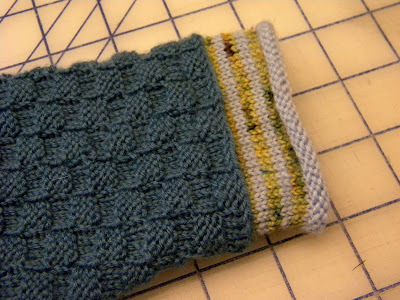 It is all so perfect-looking and I can never believe how you can be dissatisified - I do like the sleeve seam here, too, as I like doing 3-needle bind off anyway for its tidiness. For this shape garment it is great. I do the same thing to attach sleeves - pick up stitches around the armhole and then use a three needle bindoff with the live stitches from the sleeve. Elizabeth Zimmermann called the discovery of "new" techniques "unventing" since she said nothing in knitting was really new, just new to the knitter - I wonder how many knitters unvented this one before us? But it works really well and makes a nice, nearly invisible seam.